This is a 3 day project I've started which is now somewhat ready for a first release. The scenario does not include any newgrfs at this time, adding those is at your own risk. This scenario was created using a patched version of r26275, which can be obtained below. This version includes the 'extra large maps' patch, the 'more height levels' patch, a daylength patch and and the station coverage patch. It is recommended that you use the linked client for playing this scenario. Last edited by LSky on Tue Jan 28, 2014 3:45 pm, edited 1 time in total. All I can say as Im looking the map is about Estonia... City called Ahtme I would replace it with Narva as its close by and third largest city in Estonia. Second city called Võhma isnt on island called Saaremaa (actually it is but it very small place and I wouldnt point that out) its next to Viljandi in Viljandi County. Other citys are in place or almost in place. Narva is just outside of the map and therefor can't be placed. In hindsight I'm not even sure why I added Võhma, but it showed up on Google Maps (100km scale). I didn't verify that particular village's size. Thanks for your input, it will be improved on in the next release. Narva is just outside of the map and therefor can't be placed. Fair enough! Then maybe Kohtla-Järve. On the wiki page... or all the 6 districts. Hi, nice work! I can't open your scenario. I downloaded the patches but I don't know how to install them. I actually run a 1.4 bêta version. Do I need the nightly version to run this scenario? What's the difference between the 1.4 and r26275 version? But you will need the custom patched version that is linked under "client download" in the first post to open this scenario; because of incompatible savegameversion of the scenario with other versions. Thanks, it looks a little bit too complex for me. I'll wait for the official release if it ever appears. I think Ekenäs (Only finnish city on this map) should be called "Tammisaari". Ekenäs is Swedish name to "Tammisaari" and Tammisaari is Finnish town. It has some Swedish population, but it is still in Finland. I also find it very difficult to install patches, so I will have to wait for the final edition.When will this map be completed? You dont need to install patches to play this scenario. You just need to run the modified client that available for download in the first post. Although since OpenTTD 1.4.0 now allows for larger map sizes, it might be that LSky will re-create this. I'll be working on this in the future. Great job! Hope it will be soon playable in the new 1.4 version of the game. And just one suggestion - is it possible to make the heightmap a big larger so it will include Istanbul in Turkey, at least one big city in Russia (such as St. Petersburg) and Helsinki in Finland? There would be much more playing options then for e.g. network of european airliners or so.. 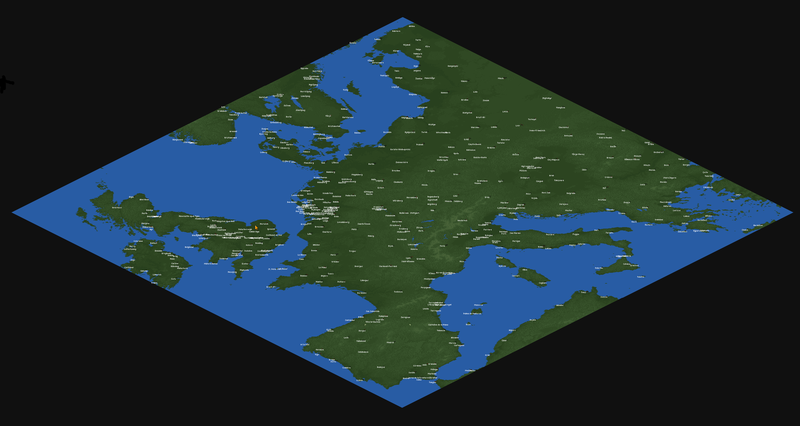 I tried finding proper height maps to include more countries, but for some reason I wasn't able to at that stage. For now, this project is on indefinite hold as there's other things that have more priority. Perhaps I might pick it up again in the future. Who cheers turn this scanario to play in the current version? who can put together a new compilation with this version but has a patch that allows more GRF, departures and arrivals of the vehicles? Someone has the version that is not available? Or who is encouraged to convert the scenario map to use in the current version? That's 3 posts in a row. Try not to bump a topic unless you have something new to contribute. where 3 posts in a row? Someone has the version that is not available? Or who is encouraged to convert the scenario map to use in the current version? All making the same request.